For some reason, crazy scientists from South Korea have created a dog that glows in the dark. Seriously. 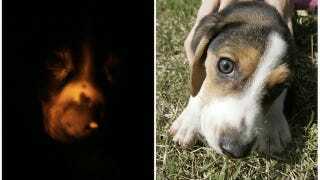 The beagle, named Tegon, was cloned and genetically modified so it lights up when you put it under ultraviolet light. It sounds completely gimmicky and terrible but the South Korean scientists said building the glowing dog could help find cures for human diseases such as Alzheimer's and Parkinson's. Born in 2009 through somatic cell nuclear transfer technology, Tegon's glowing ability can actually be turned on or off with medicine (a doxycycline antibiotic) which according to lead researcher Lee Byeong-chun, "opens new horizons since the gene injected to make the dog glow can be substituted with genes that trigger fatal human diseases."